Super Slam Dunk Touchdown is a retro styled, local multiplayer, couch-competitive, all-sports mashup driven by a 3D physics engine. Assemble a crack squad of sports athletes and use their unique shot styles and abilities to score goal units and demolish the opposing team. American football players tackle, soccer players steal, roller derby players skate and everybody dunks! Battle for control of baseballs, basketballs, bowling balls, tennis balls, and more. Configure your matches your way, and play with up to six players locally, 3-on-3. Watch out for banana peels, streaking fans and ice resurfacing trucks, not to mention the opposing team! Over 1,500 PAX South attendees got their hands on Super Slam Dunk Touchdown, but it wasn't all fun and games. After each game, data was recorded on each player type for analysis. Data analyzed includes: Shot percentage, total points, times stunned and KOed, points scored by goal type, and more, all by each player type to determine each player type's strengths and weaknesses. Check out the post here, full of graphs, grids and explanations to gain a deeper understanding of what went into the good times had at PAX. It's game day! 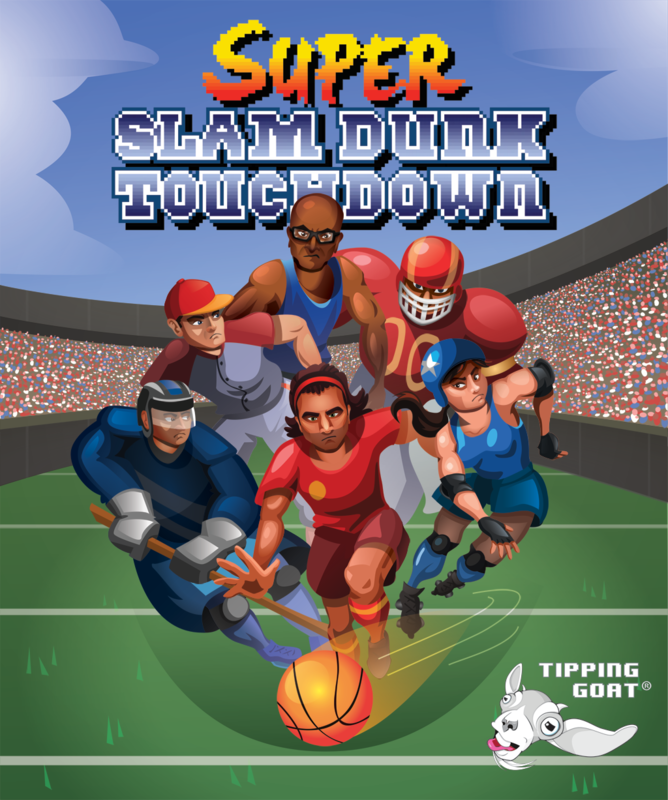 Super Slam Dunk Touchdown is now available on Steam! Grab a couch and five friends, because Super Slam Dunk Touchdown is here to take local multiplayer gaming and punt a home run! This game is amazing. Played it at GDC and can't wait to see it finished! Got to play this a few times at the conference. This is one of the most exciting things I saw there, indie or otherwise. Can't wait to get my hands on a copy and have some 3v3 local tournaments.